Aikido is a modern Japanese Martial Art and Self Defence system based on traditional Samurai principles. Training involves ‘hand to hand’ Waza (techniques), Meditation and Misogi breathing, and also advanced practice with the traditional Japanese Weapons of Bokken (sword), Jo (staff) and Tanto (knife). Aikido (合気道 Aikidō) was developed by O’Sensei Morihei Ueshiba as a synthesis of his martial studies, philosophy, and religious beliefs. 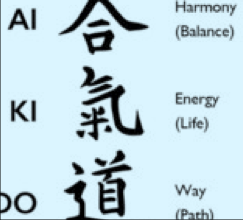 Aikido is often translated as "the Way of unifying (with) life energy" or as "the Way of harmonious spirit." O’Sensei’s goal was to create an art that practitioners could use to defend themselves while also protecting their attacker from injury. Aikido is performed by blending with the motion of the attacker and redirecting the force of the attack, rather than opposing it head-on. This requires very little physical energy, as the aikidōka (aikido practitioner) "leads" the attacker's momentum using entering and turning movements. The techniques are completed with various throws or joint locks/manipulations. Aikido derives mainly from the martial art of Daitō-ryū Aiki-jūjutsu, but began to diverge from it in the late 1920s, partly due to O’Sensei’s involvement with Ōmoto-kyō. O’Sensei’s early students' documents bear the term Aiki-jūjutsu. Many of O’Sensei’s senior students have different approaches to Aikido, depending on when they studied with him. Today Aikido is found all over the world in a number of different styles, with broad ranges of interpretation and emphasis. However, they all share techniques learned from O’Sensei and have concern for the well-being of the attacker.